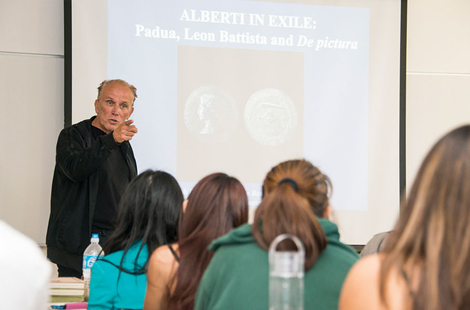 Peter Weller, well known for his title role in the 1980s hit movie Robocop, spoke to an Italian Humanism and Renaissance class at CSUN. Weller, who has a doctorate in Italian Renaissance Art History, shared his insight about that prolific period’s works of art. Read more about Peter Weller. CSUN graduate student Matt Young spent the past week at the Sundance Institute in Utah, discussing his new show with some of Hollywood’s top television writers and producers. Read more about Matt Young. Senior Demonte Thompson is one of more than 18,000 CSUN students who received Pell Grants. Among public universities that is the most in California, and third most in the United States. Read more about Pell Grants. Wed., Oct. 15 - 19, 7:30 p.m. Thur., Oct. 16, 7:30 p.m. Sun., Oct. 19, 6 p.m.
CSUN is collaborating with the world-renowned W. Edwards Deming Institute to present an “Innovation for Success” conference Oct. 17-19 in Van Nuys. The Alumni Association is partnering with CSUN Outdoor Adventures on a hike to one of the most iconic spots in all of Southern California — The Hollywood Sign. CSUN alumni were among those represented at a California State University system gathering in Denver on Oct. 4 at The University Club of Denver for a night of networking and fun.